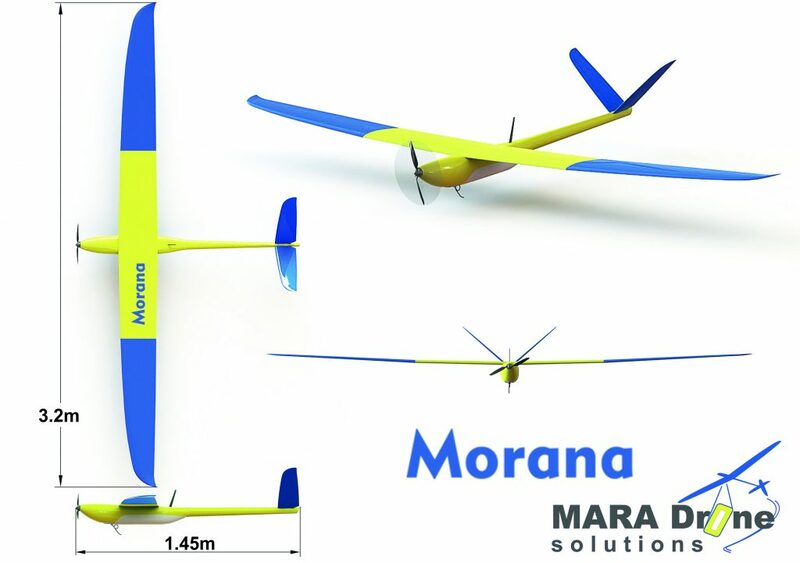 «Morana» – long endurance, simple and flexible small unmanned aircraft platform. It has been developed for VLOS, BVLOS missions like monitoring and surveillance of long ranged facilities, such as oil and gas pipes, power lines, roads and rail, agriculture areas etc. It can cover an aerial survey area of more than 1000 ha in one flight. Maximum take-off weight – 7 kg (for hand launch) , including 2 kg battery and 1kg payload. Endurance – up to 240 min. Total track length – up to 250 km. Flying speed – 55 – 150 kmph. Hand launch (bungee start is also available). Parachute recovery or belly landing. Large, easy disassembling user customizable payload bay. Single flight aerial survey area – up to 1000 ha. Fully molded “MORANA” airframe has strong fuselage made from Kevlar, wing and V-tail made from Kevlar composite sandwich with a Herex foam core. Battery bay can hold up to 1.8 kg battery (6s LiPo 12000 – 16000mAh or 6s6p 18650-LiIo battery). Drone can be shipped as a kit, including airframe, installed servos, motor, ESC and prop, or ready to fly set with Pixhawk autopilot, Ublox N8M GPS, airspeed sensor, wiring and power distribution board. Rigid and lightweight transport case allow You safe storage and transportation of Your equipment and drone. installed​​ power​​ plant​​ (motor,​​ prop​​ and​​ ESC). installed​​ and​​ configured​​ avionics​​ (Pixhawk​​ autopilot,​​ GPS​​ receiver​​ Ublox​​ N8M,​​ airspeed sensor,​​ UAV​​ power​​ ON/OFF​​ switch,​​ power​​ distribution​​ board​​ and​​ electrical​​ wiring). You​​ only​​ have​​ to​​ add​​ Your​​ own​​ Payload,​​ radio​​ control​​ and​​ telemetry​​ datalinks,​​ and​​ battery. rigid and lightweight transport case. You​​ can​​ also use​​ any​​ laptop​​ with​​ USB​​ interface​​ as​​ mission control​​ station or ​order rugged special “MARA-GCS” ground control station.